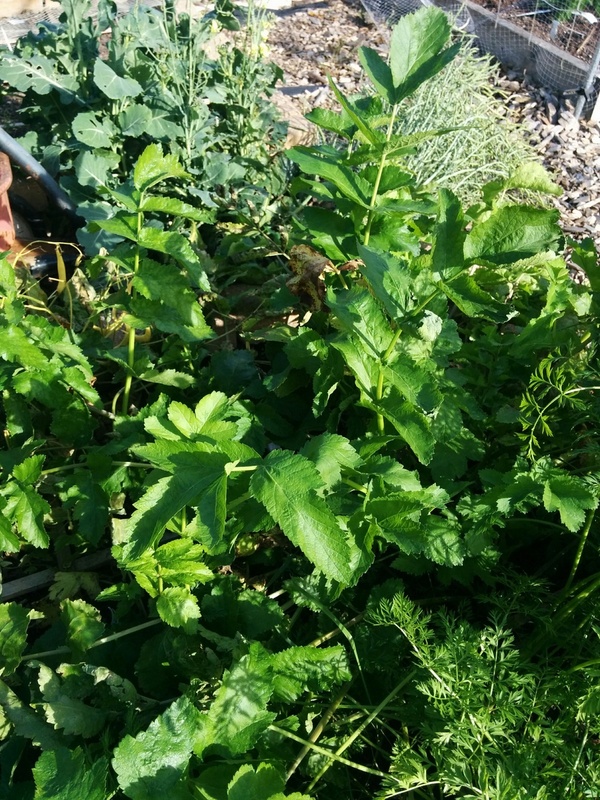 I passed eleven bags of leaves through my leaf shredder, then used some of the shredded leaves together with some greens to fill my SoilSaver compost bin. Still have of lots of shredded leaves to use. 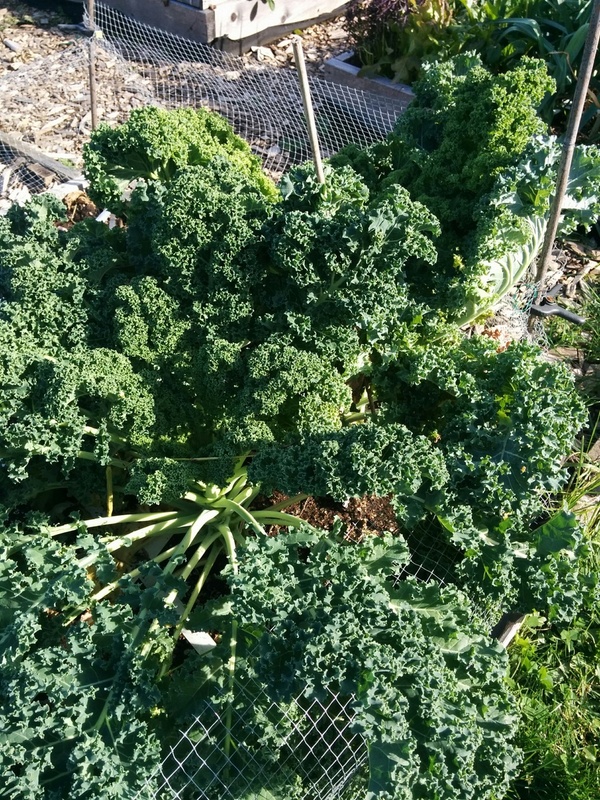 Things still growing and/or waiting to be harvested in our SFG and other veggie/fruit gardens include collards, kale, bunching onions, leeks, lettuce, carrots, parsnips, peas and raspberries. 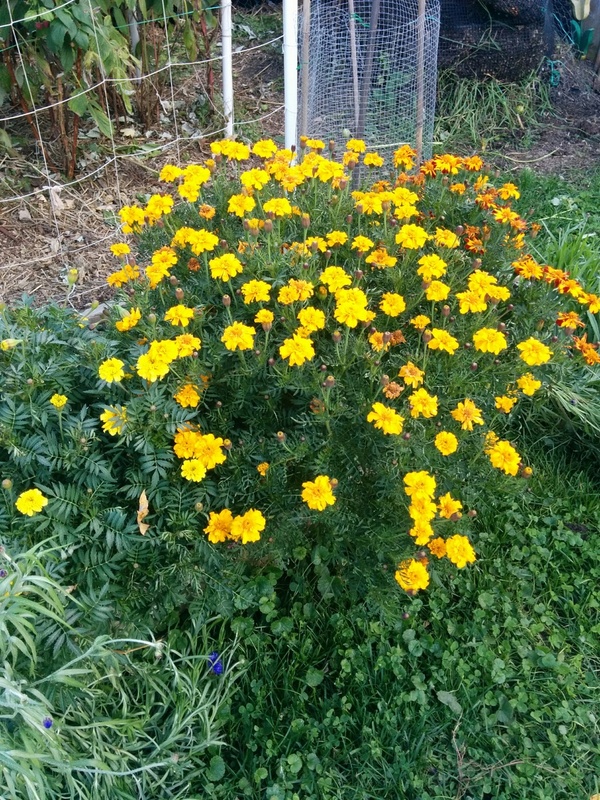 Some marigolds continue to add colour. TD, you have an awful lot to lose if you have a heavy frost. Do you have anything covered? @Kelejan wrote: TD, you have an awful lot to lose if you have a heavy frost. Do you have anything covered? I've been blanching and freezing kale and carrots. 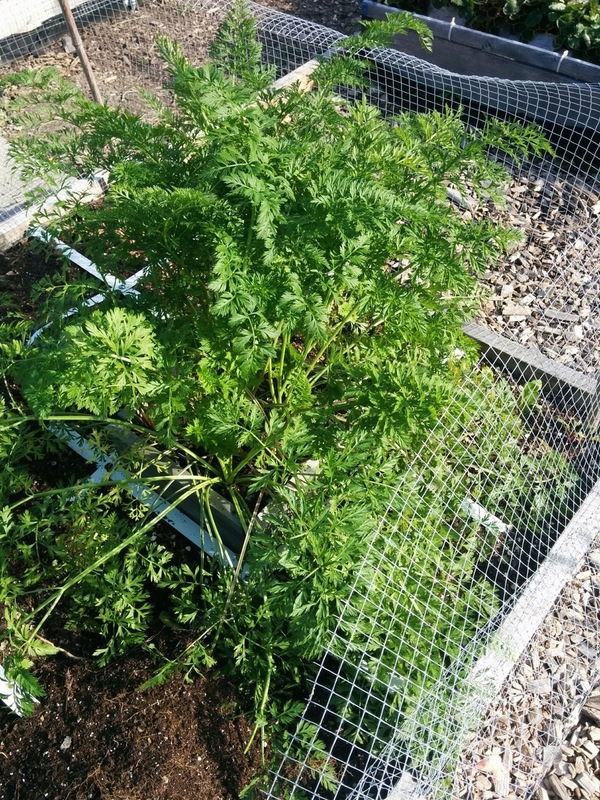 The parsnips should be OK for a while. I need to get going on harvesting. So far I have not covered. We have already had some frost. 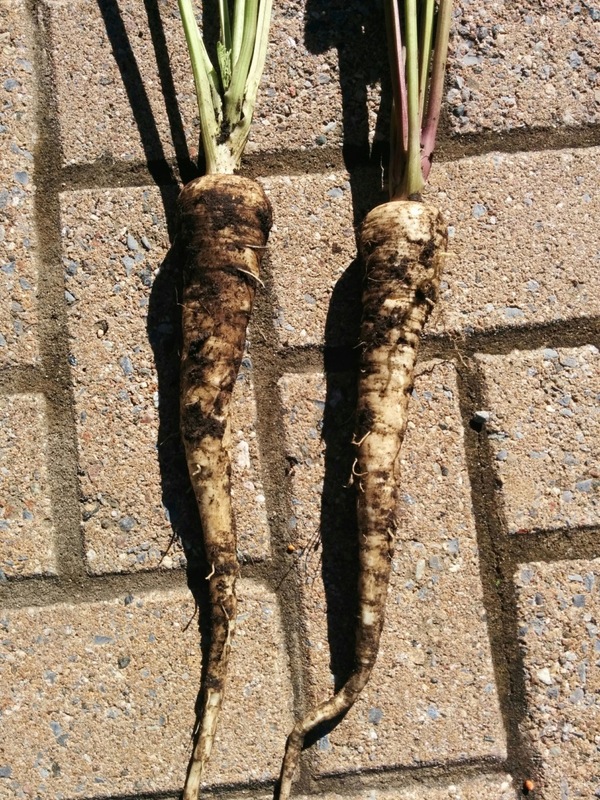 Dug up a couple of my very first home grown parsnips today from one of my old style SFG beds. 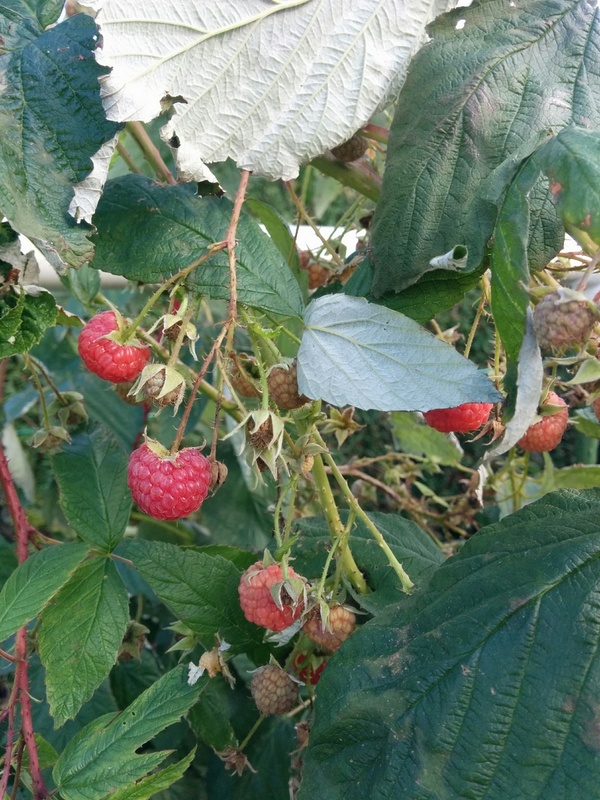 There are more to be harvested. 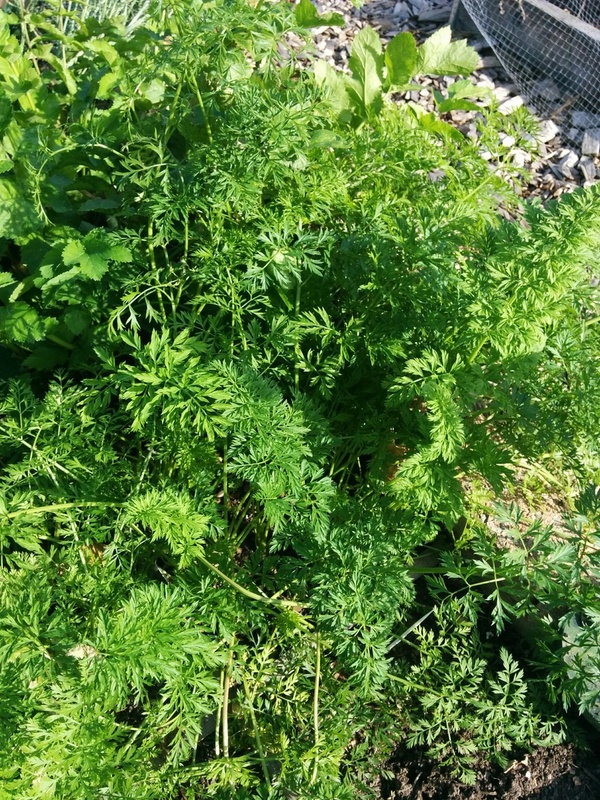 I will have to grow them again next year. I went through the last few pages of my 2017 "Third Year SFG in Canada" thread to see how I am doing with this year's end of season cleanup compared to last year. Things look to be very similar. 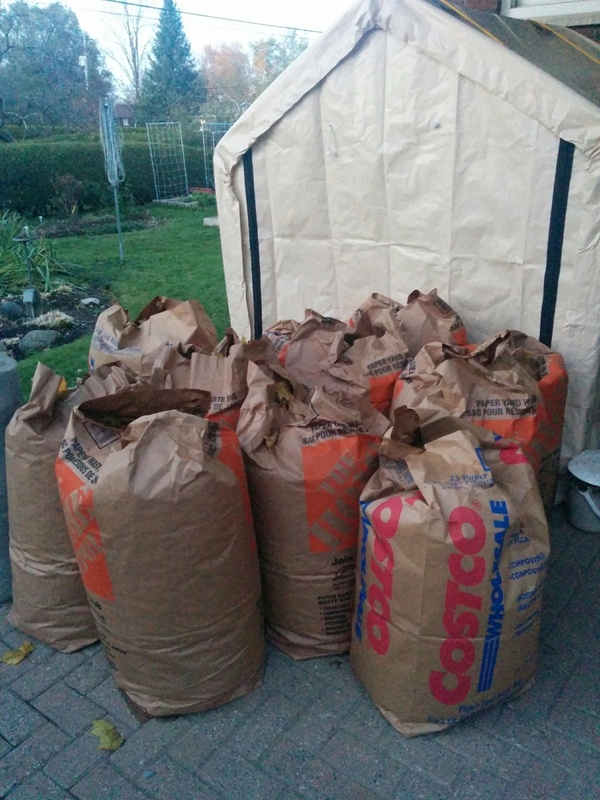 If anything I may be a little behind on getting the compost bins filled. I am still acquiring tons of leaves and using the leaf shredder to mulch them up for composting. I blew this bunch off the neighbour's lawn. She has a contractor who mows her lawns and she uses chemicals on them so I do not want to mow the lawn and leaves together. 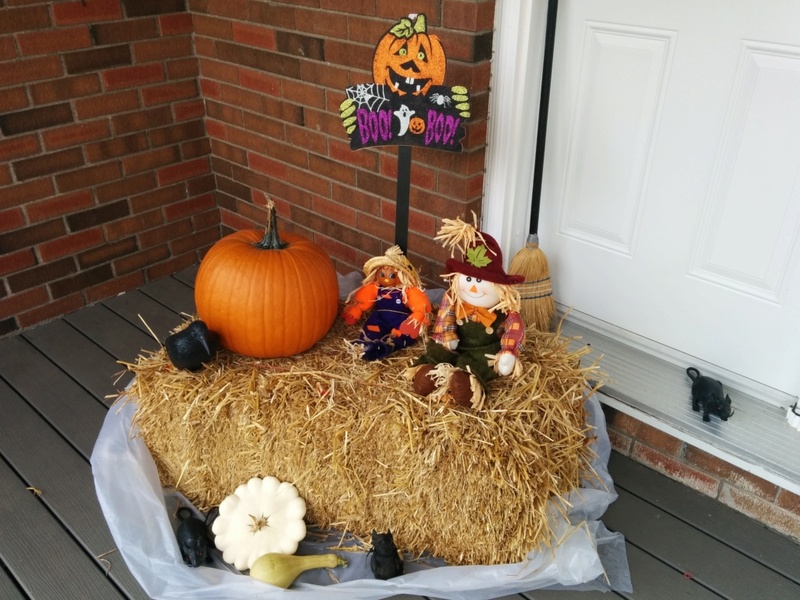 Mrs TD put together a little display on our front porch for Halloween. Still have to carve the pumpkin. We usually do not get many kids at the door on Halloween. 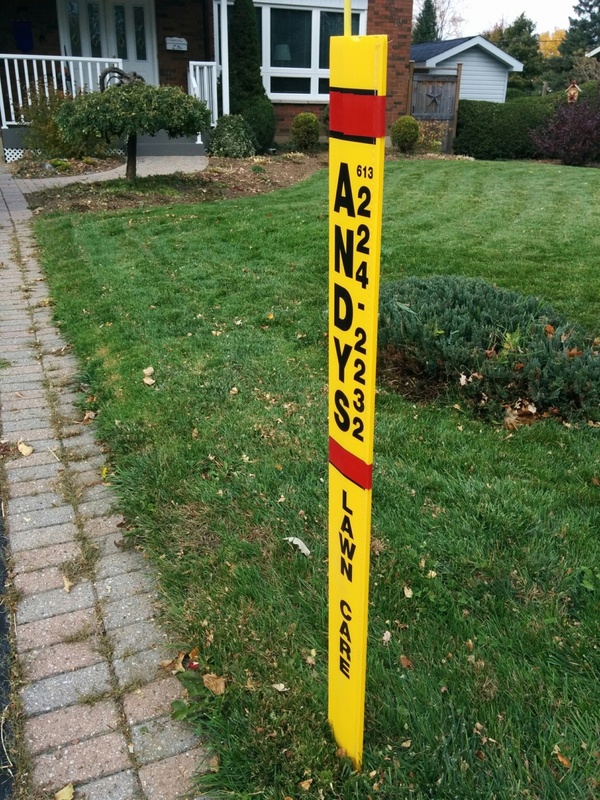 Our snow removal contractor has put up stakes at the end of our driveway. Yeuky winter is coming. The contractor does lawn care in the summer but I only use them for winter snow removal. @trolleydriver wrote: . . .
My SoilSaver compost bin is slow cookin' at 110F. That's a pretty good temp considering the overnight outside temps are around freezing. Wish I could buy one of those spiral compost cranks. Have not been able to find one for sale in Canada. @trolleydriver wrote: My SoilSaver compost bin is slow cookin' at 110F. That's a pretty good temp considering the overnight outside temps are around freezing. I thought you meant one of those cranky people who uses a spiral compost tool. Never mind, TD, even 110 degrees means that the compost is doing its thing. Just takes longer. "Compost Crank" ... That would be me whenever I have to turn the compost. You mean Cranky Compost Turner? @Kelejan wrote: You mean Cranky Compost Turner? Today I cleaned out the 3x3x3 compost bin that had a little less than a foot deep of leftover material in it. I used my compost sieve to take out the finer pieces for use as compost. 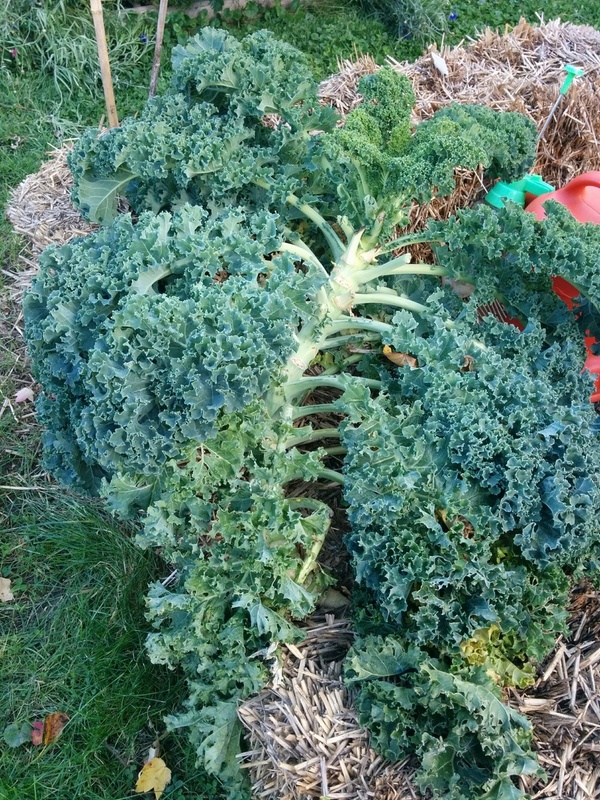 The larger chunks will be recycled into the compost bin or used as a winter mulch. Then I started refilling the bin with fresh material (shredded leaves, grass clippings, plant material). Only got about a foot depth of material so still a long way to go to fill it to the top. 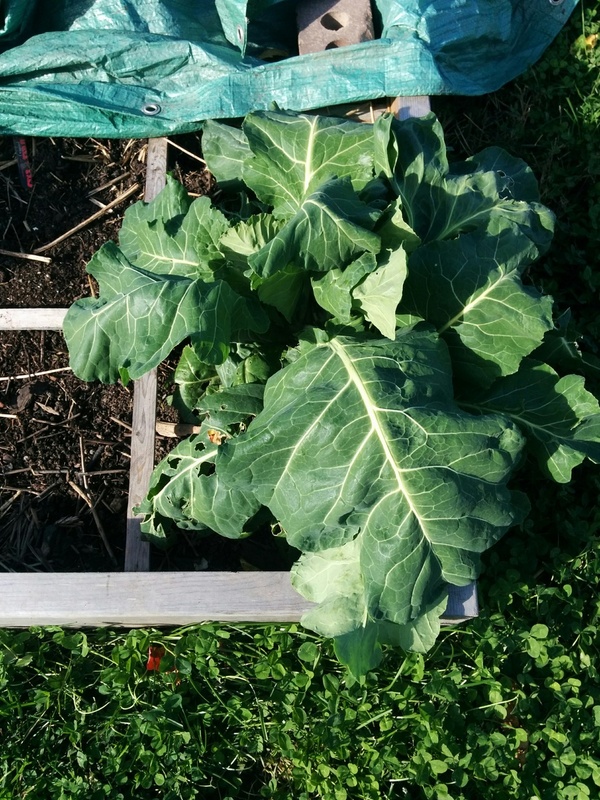 I also added compost to the squares in the 2x6 leg of my U-Bed. 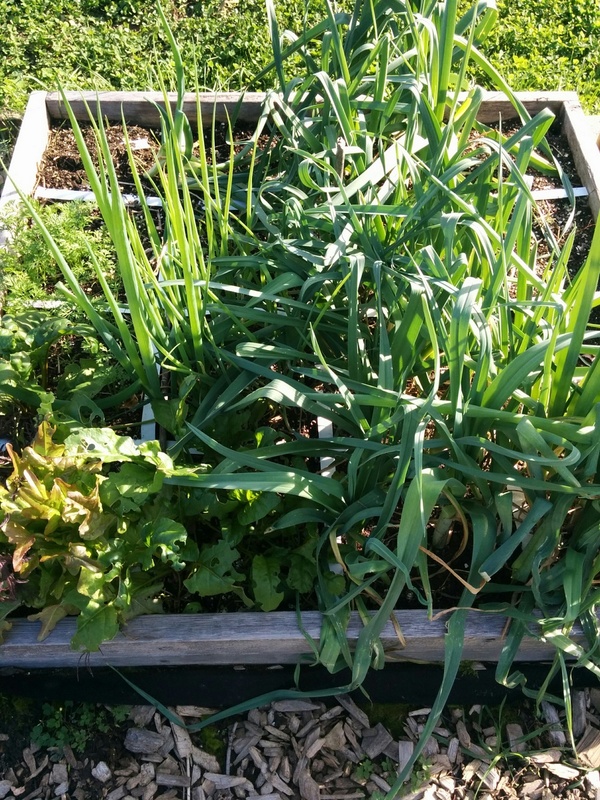 Some of those squares will be planted with garlic. 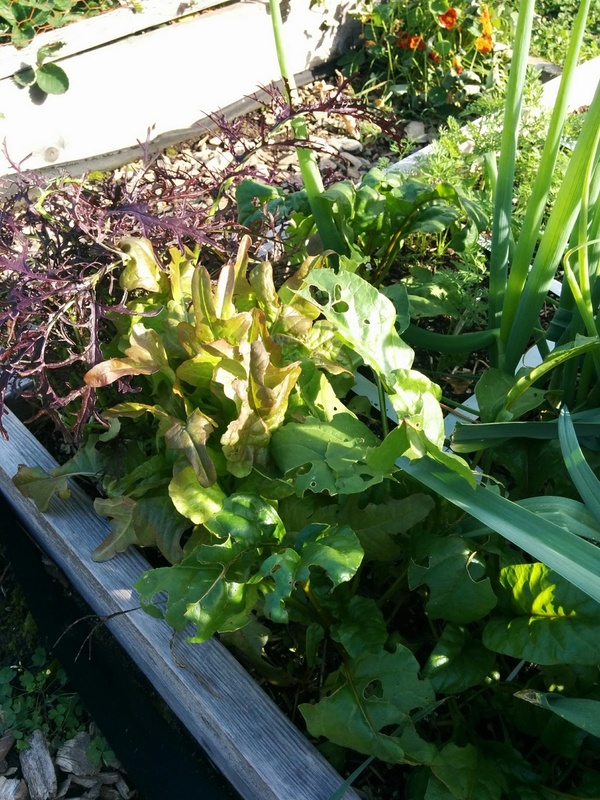 I still have kale, leeks, bunching onions, carrots, parsnips and lettuce in the SFG. I used some of the kale, lettuce, onions and carrots in a lunchtime salad. The SoilSaver compost bin is at about 120F. Thursday and Friday overnight temps will be -3C (27F). Great minds think alike. Ken helped build a new batch in the Lifetime tumbler, the 11th batch. PS Mrs. TD's Halloween display is nice! I think I know what will happen to the bale of straw. 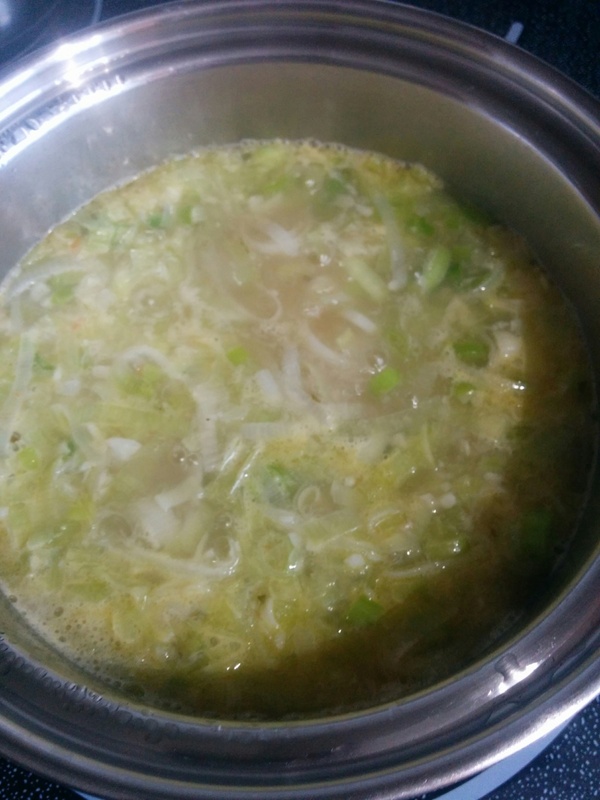 I made my annual batch of leek and potato soup today. 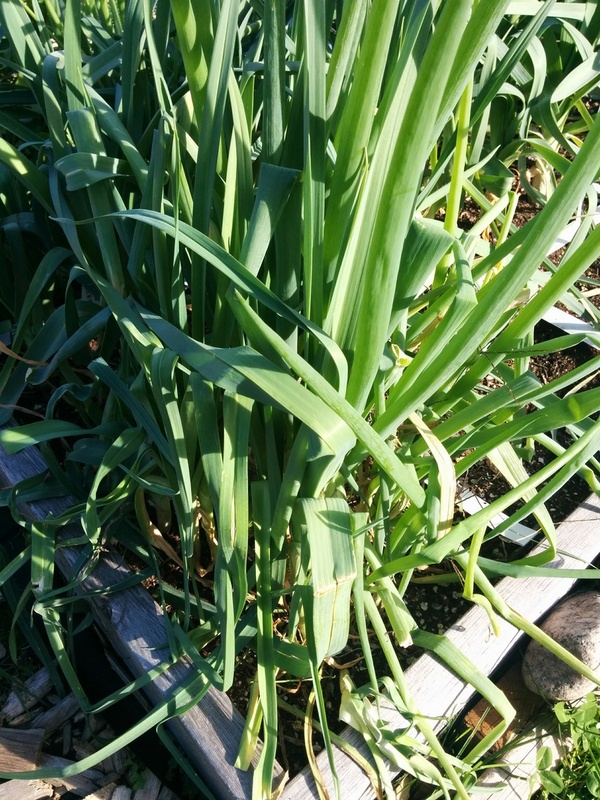 Ingredients from the garden were leeks, garlic and chives. 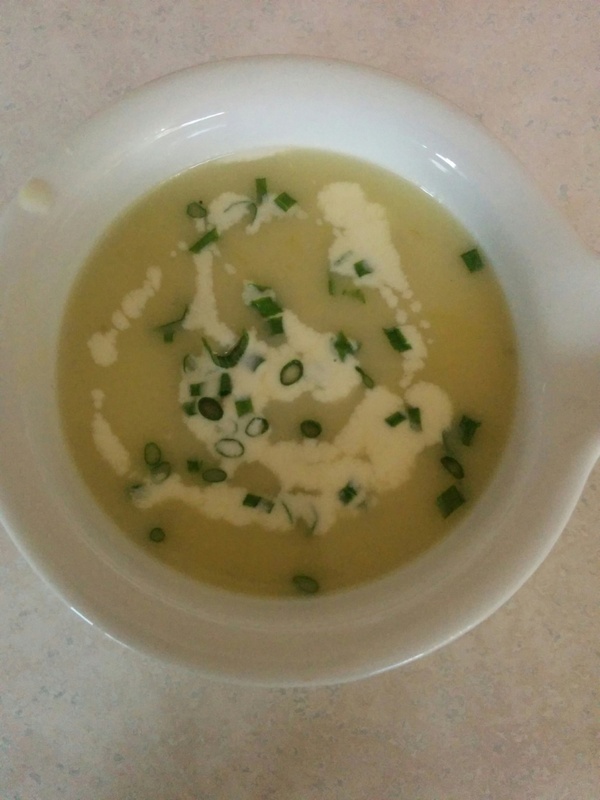 Potatoes, chicken stock, butter, and heavy cream were store bought. A modified Julia Child recipe was used. 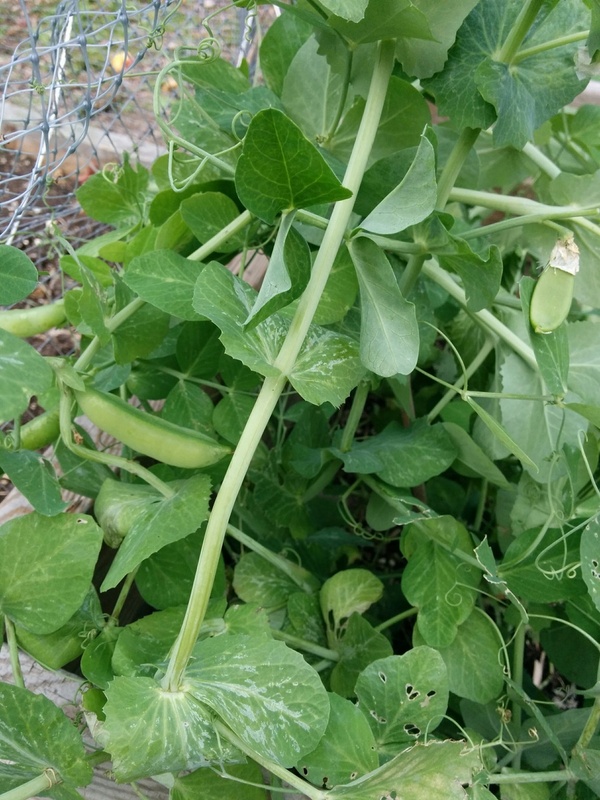 In the past I have obtained chicken manure from friends who have a hobby farm. Last night they suffered a devastating fire at their lovely rural home. Thankfully all are safe but the mother suffered a heart attack and is in hospital. The newspaper reports that "Residents at ... called 911 at about 8 p.m. to report a chimney fire. When firefighters arrived they found the fire had extended from the chimney to a exterior wall and into the attic of the two-storey home. A woman, a child and a pet dog were in the residence at the time of the fire. After a 90-minute battle, firefighters were able to save the home, but five people and the pet will be temporarily displaced." How sad. I can't imagine. I hope the mother makes a full recovery. 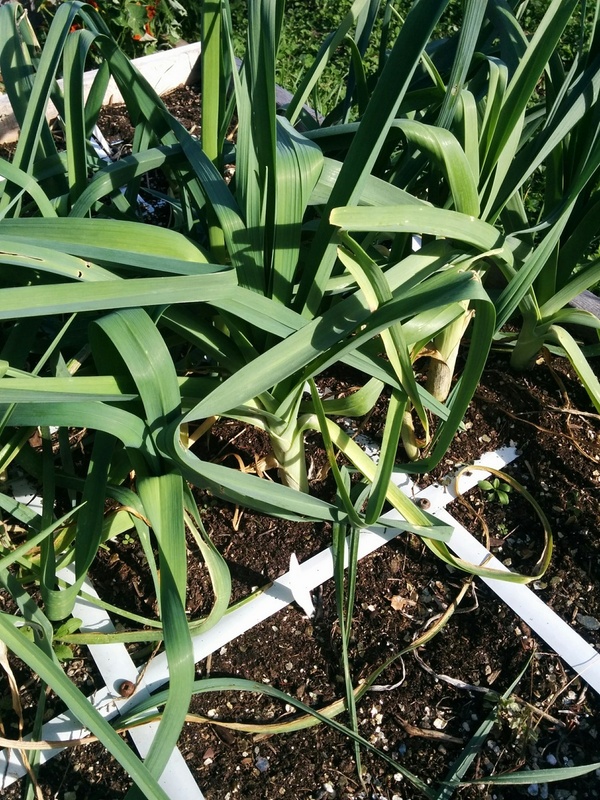 Yesterday I got a massive four squares of garlic planted. This consisted of three squares of way too expensive nursery bought cloves and one square of cloves from what I grew this year. 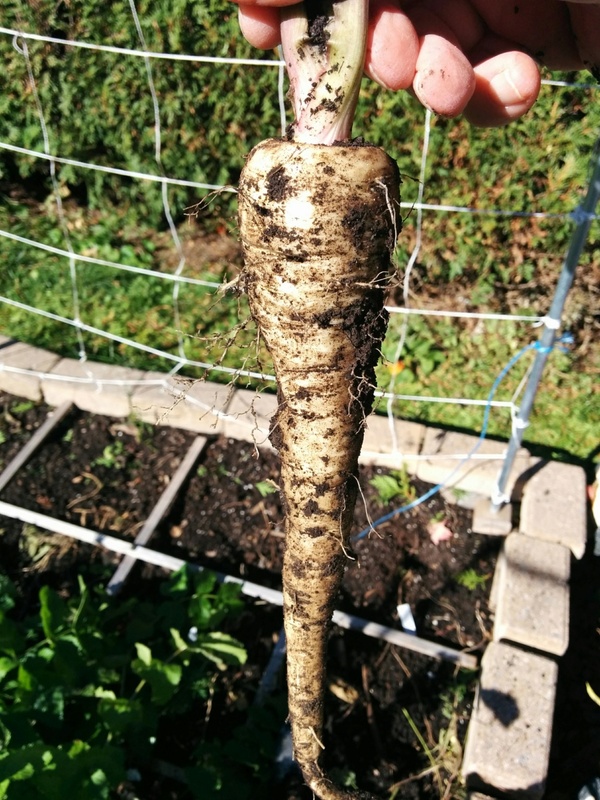 I plant hardneck Music variety which produces large heads with large cloves. 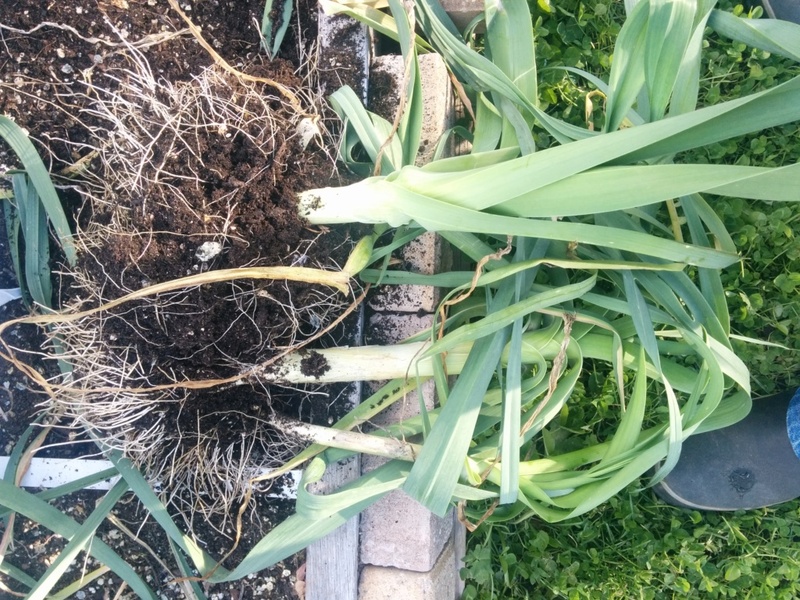 So I plant only four cloves per square. I am hoping to get at least six more squares planted soon. Sure feels wintery here ... cold, windy and snow in the forecast for tonight and tomorrow. Bought a portable storage shelter today. The photo is from the seller's website. Because we now own an SUV there is not enough room in our garage for the snowblower. So this shelter will become it's new home for the winter. Congrats on the parsnips, leeks, planted garlic and collection of leaves, TD! We don't have many fallen leaves yet. Maybe tomorrow though as there is a nor'easter passing through right now. Woke up to this on Sunday October 28. 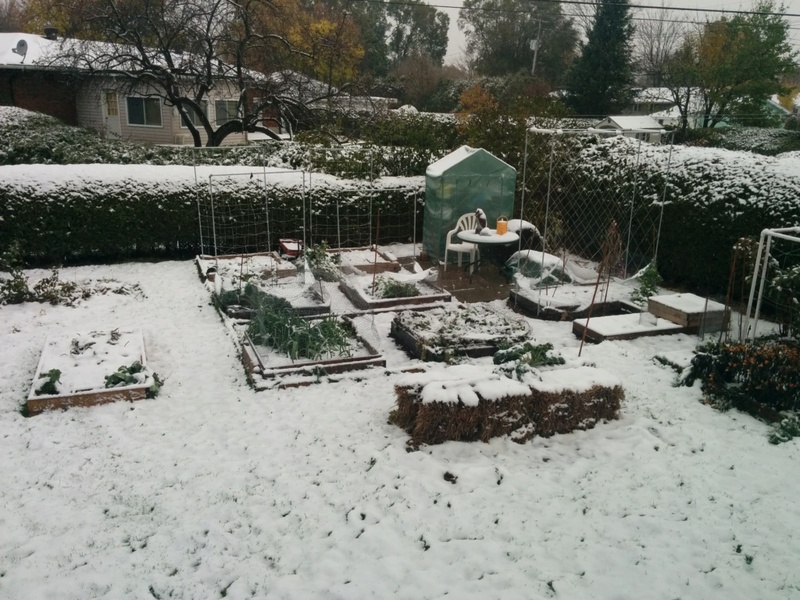 @trolleydriver wrote: Woke up to this on Sunday October 28. 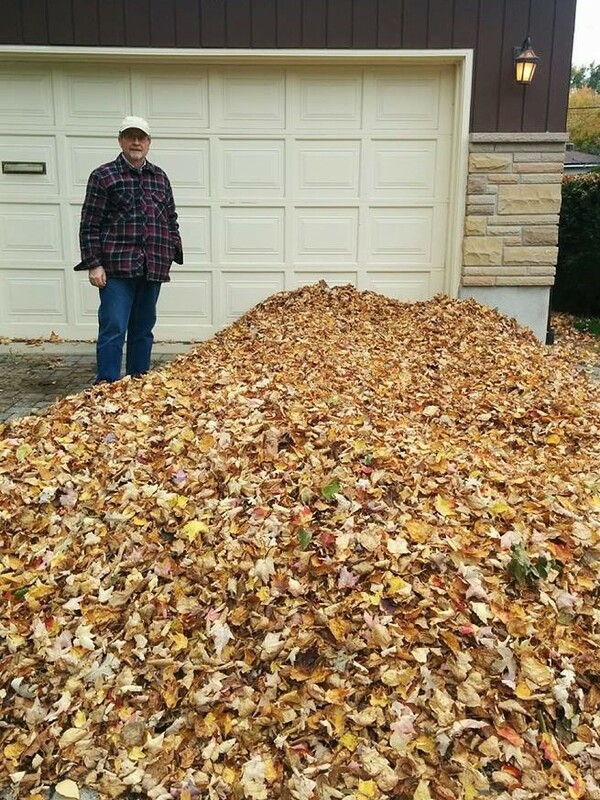 Scored 12 bags of maple leaves today. Could have brought home hundreds of bags there are so many in the neighbourhood. 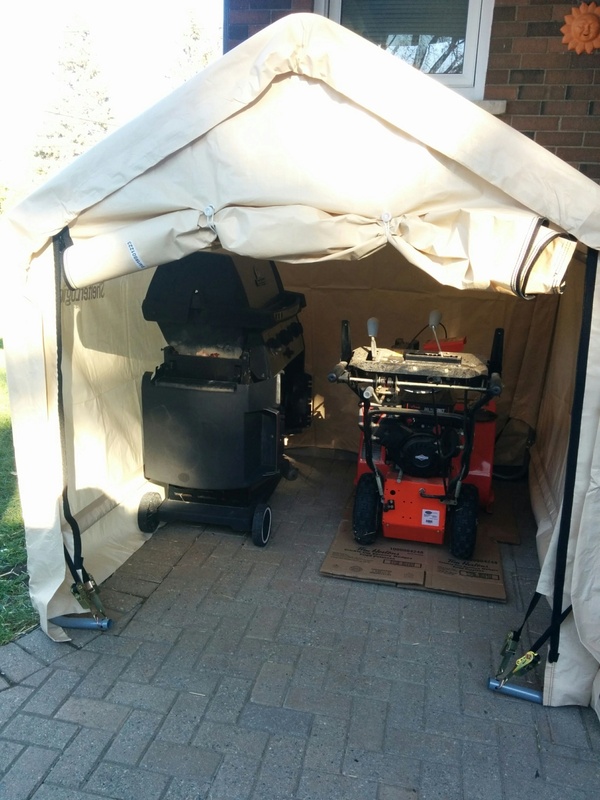 Also put up temporary shelter for the snowblower and other things. Nice! I hate my leaves...wish I cared enough to do this. My whole front yard is silver maples. I just cannot do it??!!! TD, leaves and more leaves! TD, I see that your lovely little shelter is on bricks. Will it not blow over? How is it anchored?